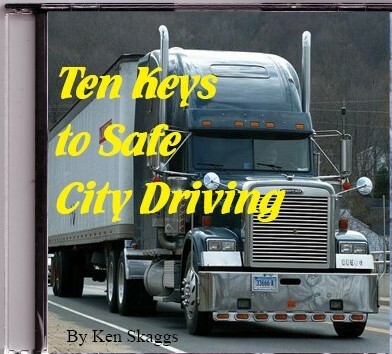 Ken Skaggs' Seminar - Ten Keys to Safe City Driving! For the past eight years, I've been writing about City Driving for Ten-Four Magazine. Plus, I've been a trucker for about twenty-five years, while living and working (mostly) in Chicago. In all my years of trucking and writing, I have attended at least three dozen orientations at some of the top trucking companies in the Country. I have seen how the best do it, and I can honestly tell you that not one of them covers City Driving, at all. What's worse, City Driving is probably the most difficult aspect of trucking. Some of the problems city drivers encounter on a daily basis lead many drivers to a long, frustrating career, full of one aggravation after another. They get frustrated because they have to face traffic jams everywhere, more and more lately, when they have no time to lose. They get frustrated when they keep getting stopped by one traffic light after another, whenever they get to any major metropolitan area. Just by simply being conscience of the fact that you are in a hurry, is frustrating to almost anyone, and truck drivers are almost always in a hurry, all of the time. Then, add to that, the fact that other people keep getting in the way; traffic on the road, communications with dispatch, phone calls, fuel, etc. Their fuse grows shorter with the years, or, they learn how to cope with it and somehow find the strength to smile at people. That's why I always say that patience is a skill. Just like learning kung fu or playing the guitar, you have to practice patience if you ever want to get good at it. It's a necessary skill for truck drivers. A trucker without patience is like a mechanic without a screwdriver. Now Available on VIDEO! Just released 5/08/2008! The problem is, most drivers look at it emotionally, when they could be taught to look at it logically. It's not their fault. It's just that most of them never thought of it that way, because they were never taught the logic of it all. Most drivers understand the logic of open-road driving; logbook math, travel times and more. But when a big city throws a monkey wrench into their plans, they need to know city logic. That's what the Ten Keys to Safe City Driving do. They teach the logic. Why do we get emotional? What causes traffic jams and road rage? How much time am I really saving when I speed in a city? How long does it take to drive five miles in Chicago? How can I be safe and hurry at the same time? Drivers are thinkers. They have plenty of time to analyze everything while they drive, and they do. Let's give them this logic and let them think about it for a while. Wouldn't you like to see a reduction in rear-end collisions, lane-changing accidents and road rage incidents? And, at the same time have happier, healthier drivers? If these Ten Keys can prevent just one, very minor accident, and I think they certainly will, then it will be well worth the investment. Especially, when you consider the Tenth Key- How to Make Sure an Accident is Never Your Fault. What better way is there to let a driver analyze the logic of City Driving, than while he is driving and looking right at it (while listening to the CD explain it)? The CD's are only $1.00 each if you burn them yourself from our MP3 files, or $6.00 each for an actual CD in the mail, and shipping is included. If you buy the video, you also get the MP3 files, so you can burn as many CD's as you need. Please, order some today here and help spread this important message. We deliver right away. Check out the Complete Package for trucking companies and truck driving schools. 1. Understand Traffic Waves - When you understand what traffic waves are, you can easily dissolve them. 2. Prevent Traffic Jams - By understanding what causes traffic jams, you can actually prevent them. 3. Stay Calm - It's easy to stay calm during stressful traffic situations, when you understand what makes you stressful. 4. Do the Math - There's an easy math system (you can do in your head) that proves that only a few seconds can possibly be saved while driving in a city, so it is therefore pointless to try to hurry. 5. Be Predictable - Sudden movements cause accidents. Steady, predictable movements give others a chance to react. 6. Time Traffic Lights - Timing traffic lights so that you don't have to stop, will reduce stress and equipment wear. 7. Expect the Expected - Getting cut-off on the highway is so commonplace now, you should really be expecting it. 8. Compensate for the Ignorant - Take pride in the fact that you are one of the few who gets it. Then, you will feel sorry for ignorant drivers, instead of getting mad at them. 9. Teach Others - Help spread the word so that everyone will learn to prevent traffic jams, rather than cause them. Everyone who drives, whether it's a car or a truck, needs to learn how to prevent traffic jams. 10. Make Sure an Accident is Never your Fault - Two simple rules will keep you in the right, every time. Pound these two simple things into your head and you will never have an accident that is your fault. *These Ten Keys will not only keep you safe, they will help you stay calm under pressure, reduce wear and tear on equipment, save on fuel costs, prevent traffic jams, prevent road rage, and, help you (or your drivers) become one of the few who will one day be able to say that you have never had an accident that was your fault. Email Ken Skaggs to arrange a live seminar at your school or company here. Big City Driver is dedicated to trucking safety and safe city driving. Webmaster and founder Ken Skaggs has dozens of articles that promote Trucking Safety and Safe City Driving from a drivers perspective, but professional enough for Trucking Company Safety Departments. Here at Big City Driver you will find true stories and serious driver education lessons, like Tales of the Tailgater, Wind, the Silent Killer, Preventing Preventable accidents and Holidays and accidents. You will also find funny and entertaining stories, like Chickenhauler School, Monkeys can Drive and Driver Cuss-Out.There are lots of anecdotal, true stories and inspirational stories and articles. In this line of work, it's easy to get depressed, gain weight, and lose touch with reality because of the long periods of time gone from home that many drivers experience, not to mention the aggravation of New York City, other big city dangers and aggressive drivers. It's important for todays professional drivers to be smart enough to learn how to stay calm under pressure and keep their sense of humor, which is not easy, and, try to look at daily driving hazzards scientifically instead of emotionally, and learn to relax and entertain themselves. Many experienced truck drivers love to talk about the good ol' days, of course I am no exception. Because of all the trash-talk on the CB lately, some will argue that there was a time when drivers had class, but in my twenty-five years of trucking, I found that they still do, and even more now than ever. I think it's an age thing, or, just common sense. Audio Book on CD - Now on Video! Now available in MP3 format for immediate download! Burn your own CD for only $1.00! Or, get an actual CD in the mail for only $6.00 includes shipping! "I like these ideas and will use some of them in my Aggressive Driving Campaign"
-Jesse White, Secretary of State of Illinois. "I ran across your site by chance and was intrigued." "I think you are a very smart man and I agree with all you write about." -Jenni Sasso, Path Truck Lines. "I came across your website and I love it. I hope you don't mind if I quote your stuff." -Peter Carter, Today's Trucking (Canada's Largest Truck-Fleet Magazine). Copyright © 2008 All content written by Kenneth E. Skaggs. No unauthorized duplication. All rights reserved. City photo by PDPhoto.org. Original template by Luka Cvrk, Solucija, CSS and XHTML .